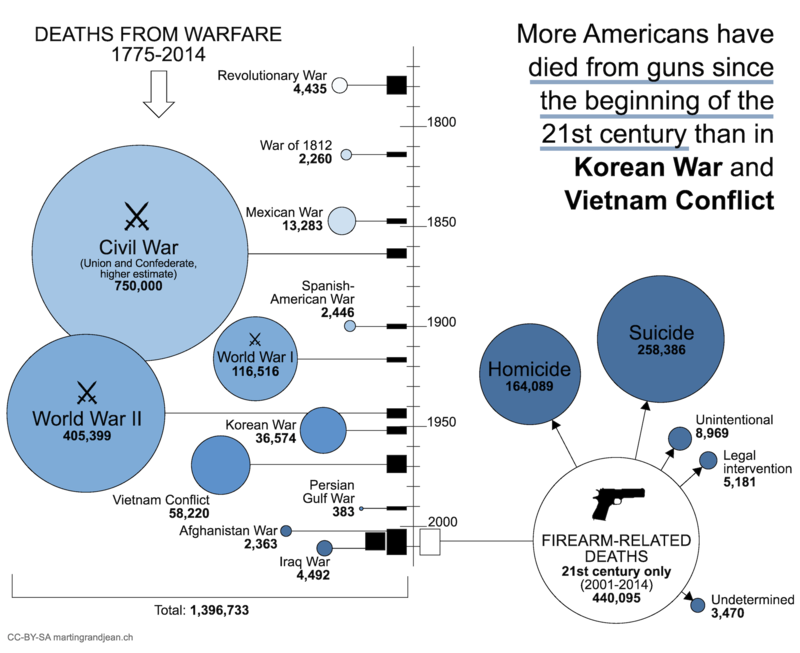 Share the post "[Visualization] More Americans have died from guns since 2001 than in Korean and Vietnam wars"
More Americans have died from guns in the U.S. since the beginning of the 21st century than in Korean War and Vietnam Conflict: 164,089 homicides with a firearm in the United States between 2001-2014 vs. 94,794 deaths at war during those two conflicts. Including suicides committed with a firearm, these 14 years were as deadly as World War II for the Americans. This visualization is a simple contribution to the understanding of this reality. CC-BY-SA Data visualization freely reusable with a link to this post. Ten years of firearm homicides in the U.S. is equivalent to all american deaths during WWI. Including suicide, more Americans have died from guns since the beginning of the 21st century than on WWII battlefields. 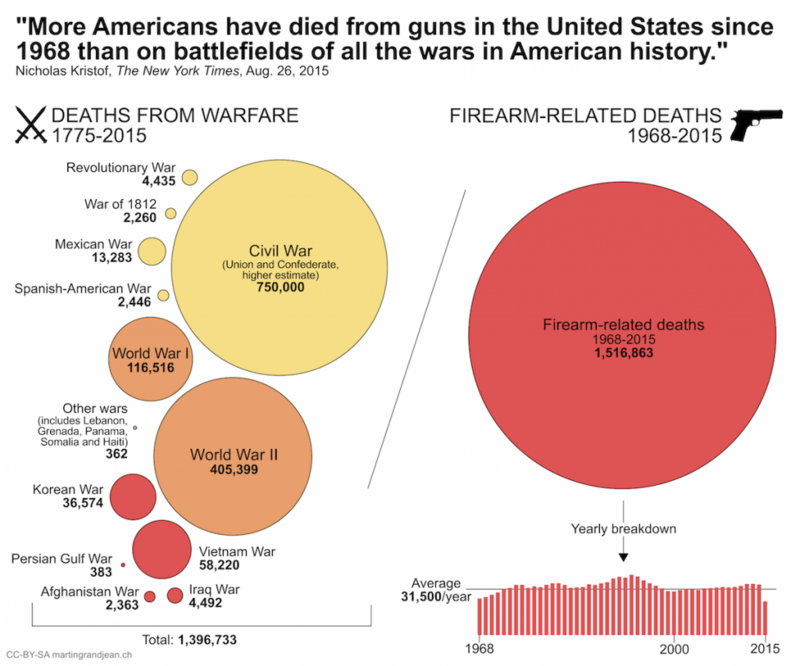 Including suicide, “more Americans have died from guns in the U. S. since 1968 than on battlefields of all the wars in American history” (see below). This visualization is an update of the post “More Americans killed by guns since 1968 than in all U.S. wars” (2015). This post is still valid, but I wanted to produce a more precise overview. In an article (08.2015), Louis Jacobson (@loujacobson) fact-checked the information published by New York Times columnist Nicholas Kristof (@NickKristof). Reacting to the murder of two journalists in Virginia, Kristof cited the calculation set by Mark Shields three years ago on PBS: “since Robert Kennedy died in the Ambassador Hotel on June 4, 1968, more Americans have died from gunfire than died in all the wars of this country’s history”. On politifact.com, Jacobson updated the figures and validated the assertion of Kristof. Based on a study of the Congressional Research Service and reports relating to most recent conflicts, he shows that 1,396,733 Americans were killed on the battlefields. Governmental reports from the Centers for Disease Control and Prevention show that there have been 1,516,863 gun-related deaths since 1968 (included suicides). Note that the total displayed on the figure also includes the 362 deaths of the Lebanon, Grenada, Panama, Somalia and Haiti campaigns, not displayed as circles. Could you please correct the diagram by adjusting so that the body count is relative (to population during the period) but not absolute? There is a strong distortation now because of population growth. Thanks for your comment. Population growth is the reason why I only compare the deaths from warfare to the firearms-related deaths on a very recent period. But, even if the demographic data make possible a kind of relative analysis for the military part, we don't have any precise statistics on violent deaths in the U.S. from 1776 to 1970 -> a comprehensive relative panorama on this part of the diagram is not possible. Knowing that, and being aware that the figures are absolutes, the graph is still understandable and the comparison is still valid: we're comparing single human losses. This is comparing apples and oranges. Most combat deaths are not due to small arms fire, especially in the 20th century. Artillery and aerial bombing are. In the case of Iraq and 'Stan it's probably IED's. You could also take number of people killed by bees and compare it to firearm related deaths. It's just a random totally unrelated to each other. But ok, I get it, you just want to promote the 'guns are bad, mkay' narrative. Why don't you compare number of guns per capita - people killed by guns and take the data from the US and Switzerland, maybe Iceland? As this would totally dismantle the narrative I strongly believe you won't do that. And about the international comparison, no need to repeat here what numerous studies show: in proportion to the number of weapons in circulation, the rate of violence by firearms in Switzerland is very much below the U.S. rate. And about the argumentative principle, try to show that others are worse than yourself does not exempt to try to improve your situation. You're avoiding the argument. Clearly you're trying to construct the politically motivated argument that somehow more guns equal more violent crime. But correlation is not causation as demonstrated by Swiss or Icelandic crime rates and number of privately owned guns in these countries. The same way one could argue that guns make people safer: California - high crime rate, strict gun laws, low gun ownership, Vermont - very low crime rate, very permissible gun laws, high gun ownership. This is non-sense of course as guns are not the cause of violence or crime because they're inanimate objects and have no magical powers to turn people into criminals. Violent crime in most western countries has decreased since the '90s, gun ownership has massively increased in the same time. If you're serious about improving (or at least trying to identify) the massive social problems, the real cause of violence in the USA, maybe you should address the real problems. You just want to promote a political agenda by manipulating public opinion. You omit facts and only use stats supporting the 'guns are bad' narrative while acting as if it's just "a simple contribution to the understanding of this reality.". I'd maybe believe that if you weren't a supporter of a totalitarian ideology. Hans -- I've gotta say I think you're interpreting this post as far more aggressive than it is. There is no argument here that gun ownership causes societal problems. In fact, gun ownership rates were not even mentioned. You mention Switzerland and Iceland as countries with high gun ownership and low crime rates; the US also has high gun ownership (as we know) but (as shown here) cannot boast the same low crime rates. The point here is not that everyone in war was killed with a firearm and that American society is in a state of war (or whatever link you think was implied), but simply that war is something that results in large numbers of deaths. Domestic gun ownership in America, as shown, is something that results in more deaths than war. This is not to say that guns caused this problem, only that the problem is there. As far as justification for taking a closer look at guns, I did about 30 seconds of research and found some data on homicides from 2009-2013. Of the ~64k murders ~44k, or 68%, of them were firearm related. Then we can look back at this post and see that homicides are a significantly smaller portion of gun related deaths than are suicides. And that there were almost 9000 unintentional firearm deaths in this period -- twice the number of American casualties in the Iraq war. The argument here is not that guns are evil and should be banished. It's that there are some serious societal issues in the United States which manifest as gun related casualties. From there you can choose to look at how we address mental health, or look at rates of responsible gun ownership (I'd be interested to see how many accidental gun deaths Switzerland has had in this timeframe), or something else I haven't thought of. There was really no interpretation as far as underlying issues or implications for law in this post at all. The anti-gun narrative is in your head. You want use simple comparison for your argument ?